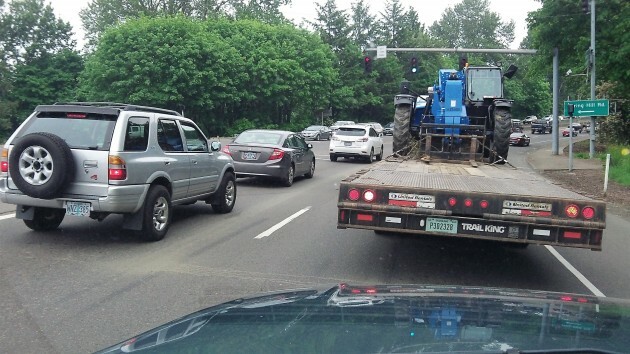 The view from my truck at 4:03 p.m. Tuesday, May 3: A little congestion but no tipping over. You’re looking (as though you can’t tell) at the curve of Highway 20 leading up to Albany’s Ellsworth Street Bridge, where Spring Hill Drive comes in from the left. The intersection has been of concern because while its steep bank is helpful to drivers on the highway, it’s a tipping hazard for trucks making a left from Spring Hill. The highway department won’t touch the issue, so the city council may. In recent weeks, a log truck tipped over making the turn, and then in another case, a truck’s load shifted, forcing it to stop in the road. Traffc was blocked in both cases. Any cyclist or pedestrian caught to the right of an overturning rig would likely be dead, Councilman Floyd Collins points out. Collins is a North Albany resident representing Ward I. At the last council meeting in April he called on the city to start talks with ODOT and Benton County about steps to reduce the truck-tipping risk. ODOT is sponsoring a safety study of the highway between Corvallis and Albany, but the agency considers that tackling the steepness of the bank is beyond the low-cost safety measures the study is trying to find. Collins would like to reroute trucks so they don’t enter the highway from Spring Hill, the way it was done during the North Albany Road reconstruction in 2015. He says that at the council’s work session Monday, he plans to bring this up. He’ll ask the council to direct the city staff to work with Benton County to designate, for reasons of safety, a truck route via Hickory Street and North Albany Road. With safety as the main reason, the city and county have the authority to designate such a route. Keeping trucks from flipping on their right side when they make a left on 20 is easy compared to doing something about the congestion that seems to develop with commuter traffic each workday afternoon. Collins thinks doing anything about expanding the capacity of the Albany-Corvallis corridor is decades away, if it ever happens at all. I was caught up in at rush hour when the log truck tipped over onto the sidewalk. It was a nightmare. Sure seems like a common sense idea worthy of discussion from Mr. C …nice. A specific truck route to minimize accident delays for the rest of us. Now bring that common sense approach to other topics please.